One evening in late summer I spotted a bat flying along the (tall and untidy) hedge at the south of the plot. I don’t think I’ve ever seen a bat in the flesh before and although it was dark and I didn’t get a particularly good look at it I’m sure it was a bat and not a bird, because of the time of day and the way it was flying – almost more like a butterfly than a bird. I later bought a bat detector to try to establish what species it was but so far I haven’t seen any more of them, so I’m none the wiser. This started me wondering whether there was something I could do to improve the habitat for bats – probably not with the main house but perhaps with the outbuildings which, before they became so derelict, would have certainly provided opportunities for bats to roost. I started doing some research and discovered that as buildings are made increasingly air-tight and energy-efficient some of the wildlife that has become used to taking advantage of nooks and crannies in traditional buildings is unable to do the same in modern buildings. One book which helps to address this problem is Designing for Biodiversity: A Technical Guide for New and Existing Buildings from RIBA Publishing, which includes detailed drawings for including bird- and bat-friendly features in buildings. 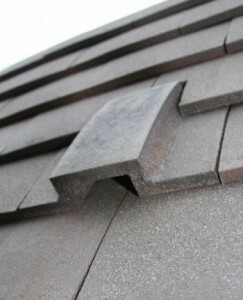 One product described in the book which caught my attention is the Dreadnought Habibat Clay Roof Access Tile Set which is designed to be used with Dreadnought clay tiles, which I intend to use for the outbuildings. A handful of these – on the roof facing away from the house, towards the hedges – ought to provide the option for bats to roost. Different orientations are preferable for different species of bats, and for winter-time rather than summer-time habitation – all described in the book. One consideration which can put people off providing bat roosting facilities is that (assuming they get used) it is a criminal offence to damage or destroy a bat roosting place or disturb a bat in its roost. However it seems that roosts are only used for part of the year so any necessary maintenance work can easily be performed as long as it is timed appropriately. More information is available from the Bat Conservation Trust, in particular from their Roost website.